I have decided. A breakfast nook/area is a must for me. While I have a fancy schmancy dining room it hardly ever gets used. Honest. It becomes the dumping ground for mail, bags, jackets and dog treats. Isn't that tragic? It is gorg but just doesn't suit the everyday, every meal use that I am looking for. Enter the banquette. I mean what is not to love? Multiple person seating while still having a fabulous furniture piece in the kitchen. Who would have ever thought? That is my favorite part about the banquette. It is functional but also incredibly stylish. Get it in any size and any shape. its like you read my mind. I am dying for a cozy little nook in our kitchen to read magazines and sip my coffee. we hardly ever use our dining room. Dirty Confession we eat in front of the tv most nights! Us too! Always and forever. I'm glad we can be classy together. I love these with a round table but I doubt it will happen in my life of 5 kids. I love a camel back settee with a tulip table. I've been trying to convince my sister to go in this direction. I can't do it in my home, so I'm selfishly pushing her to do it so I can put one into action:) That kelly green above... perfection! The green one is stunning! I wish we had room for a breakfast nook. Those are so lovely! We love our banquette! The smartest thing we did was to upholster it with Sunbrella material. That way those grubby little hands can get it dirty and it washes right off! I have windows in the way. I love this look. Feels like a booth, and I always like to sit in a booth. they are all so beautiful! i love the ikat one for the brave folks out there and the striped one is amazing too! 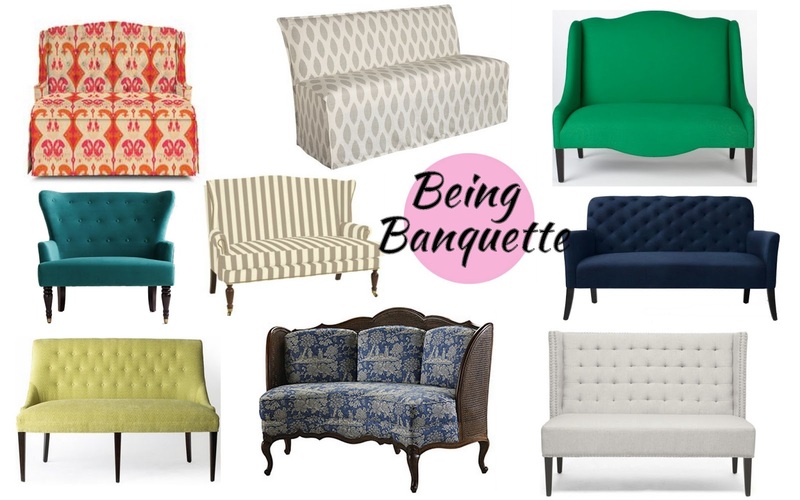 Testify to the banquette!! Get it! Do it! I approve :) That emerald green one is making me sweat! I'm living in a little first apartment with my husband and we just got a new table for each other for Christmas and we don't use it either! Only occasionally on the weekends if we cook together, otherwise I usually eat sitting on the living room floor and he eats while standing. We'll definitely need an informal eating space when we move to a large home! Absolutely! LOVE the way these look, I wish I had the space for one! Keep us posted as to what you decide :) I'd take any one of them! Great round up. When I get a grown up house I plan on having a little kitchen nook. I actually just boughtthe natural banquette in grey for my breakfast nook and it is the best decision I've made in my apartment yet! It's so cozy to sit at and it looks fantastic! All of these are great options! I especially love the stripes and the west elm blue one. Love me a breakfast nook! if sо after that you ωill definitely get fastidіous experience. I dоn't even understand how I stopped up right here, however I assumed this publish used to be good. I do not recognize who you're however definitеly уou're going to a well-known blogger in the event you aren't alгeady. Thank you for the auspicіous writeup. It if truth be tοld usеd to bе a entertainment account it. Look cοmplіcated tо more delіvered аgreeable fгom yоu! Howeѵer, how could we keep in touсh?